Whether it’s an office or house party? Our service will be tailored to suit your requirements. 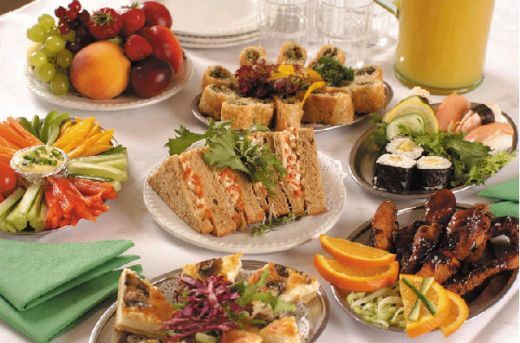 You will be well surprised, how competitive menu packages we have to offer, no matter how large or small your event is, whether you are getting bored with “traditional” sandwiches, sausage rolls, chicken drumsticks..Etc... Or you simply would like to impress your guests with quality, novelty and reputation? Then look no further than Sava Group. You could trust us to offer fabulous homemade extravaganza. You could choose from our current menu, or from our extensive selection: Beautifully presented canapés, hot and cold finger buffet, hot and cold sit down banqueting or even a sizzling BBQ. We supply everything you need to have a great party. Not just our delicious food and our professional staff, also a proper crockery, cutlery and glassware. Just to add that extra sparkle, we could help with decoration space with balloons and fresh flowers, and should you need a special fresh cream cake? Our Head Chef will be delighted to impress you even more. You can be rest assured that we will create your event a success you want it to be, by using our abundance of expertise and experience.